Today's surf at Sennen put me in mind of Australia. Most uncharacteristically, the waves actually peeled, and it was really warm (honest). Just like the Gold Coast, where I ended up some 20 years ago. Back then, I spent a night in the cells owing to a misunderstanding over the ownership of a sun lounger. It was an uncomfortable night and I was relieved to emerge into the bright Australian sun, a free man. Check out the footage below for a possibly disturbing variation on this theme. Now then, anyone who doesn't like hearing of other people's little bits of good luck, brace yourselves. If you don't like hearing of slices of good luck pertaining to yours truly, stop reading at once. For I am about to disclose that I am seriously stoked. The most obvious reason for this is that I've been shortlisted for Sports Feature Writer of the Year in the Sports Journalists' Association's forthcoming awards. But the day I've just had, as a whole, is the real story. Morning: Working on a feature for Coast magazine. Coast is a good mag and I'm always pleased to turn a few sentences for them. Sometime during the morning, I was called by a journalist from Legal Week. He wanted my views on whether the recession might propel people not into money but making a living from their passions. I explained that my own trajectory was somewhat off the wall but said that yes, I agreed with the basic thrust of his argument: if you want to be happy, don't sell out. Try and do what you're passionate about. In my case, first and foremost that's always been writing. Lunchtime: I got a text from Tup 'Maui Surf Report' Newman confirming what I suspected - there was a wave at Spot G. I downed tools and within 15 minutes was in the water. It was clean as a whistle, the usual suspects were out, and I got a few good waves, with one that was just lovely. Post-surf, Tup and I plotted a trip to Newcastle next week, before agreeing that we'd better get back to our desks. Afternoon: I'd just settled down to write more of the Coast piece when Rob Maul, an old mucker from Fleet Street, rang. "Congratulations," he said. "What for?" said I. Rob then directed me to this link, which revealed that I'm in the frame for an award that I didn't, in a million years, think I'd even be considered for. I fell off my chair, climbed back on, fell off again, and then steeled myself for the evening's delights. Evening: I live in Porthcurno. I've never actually said this on this blog but everyone seems to know, so there you go. It's a quiet and beautiful place and I love it. The wave is rubbish, so don't come here, but it's a fine spot to bring up the kids. I feel very lucky to be here. However, there's tension in the valley, as the good folk at the Museum wonder what to do with it and all their assets - land and buildings owned by Cable & Wireless and now under the stewardship of the PK TRust. Should they try and regenerate the valley, as some suggest, or leave everything as it is, so that Porthcurno can survive as an outstanding retirement home for future generations? People here appear to be discomforted in various ways at all kinds of possibilities, none of which has actually been aired in anything resembling concrete fashion, which just goes to show that the unknown is always a lot scarier than the known. But leaving that aside, I'm with Wordsworth. The child is the father of the man, and if you can't see this, you're not only lacking a basic poetic sensibility but you're rather sad. Sadly, although Wordsworth is deservedly among the most revered of British poets, myopia has yet to have been cured, and so, as I left a meeting convened by the museum to discuss the future of Porthcurno, I felt rather sad. I wended my way home, and thought of what someone at the meeting said in response to the idea that Porthcurno should be regenerated for kids and the 'younger generation': "When we drop off our perches, other retirees will move here". This attitude, one increasingly rife in so many small communities in the south west, made me feel sadder still, but then I walked through the door, saw my wife, heard the noise of the kids, thought of today's surf at Spot G, and remembered that I'd somehow, miraculously, been short-listed for the SJA awards. And I remembered what Al Mackinnon said, a few years back, when we were God knows where: "Too many people forget what surfing's all about. It's about being stoked." 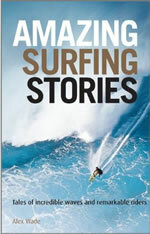 For surfing, read life. Here's to surfing, here's to being stoked, and, most of all, here's to kids. Aloha. Pictures: PK at its best courtesy of sOulsurfing. Stef Harkon entertaining the tourists by steve_cx. Big is Beautiful. Small is Safe. It was very, very small at Perran yesterday. But I ran into Ingrid, whom I met in Thurso three years ago at Rick's cafe, as well as Rich, former campaigns director of SAS. Also there were various of the Bleakley clan and Darren from Sennen Cove. As I left I bumped into Ben Cook. Surfing is nothing if not interconnected. In the water, though, there was an outbreak of aggro. It didn't involve me but I was within earshot. Some most unpleasant words were uttered. Perhaps the hour-long wait between what occasionally resembled waves was the explanation. But although it was small, I'm glad it wasn't big. As in, Oakley Surfing Life Big Wave Awards big. Here's a picture from Alex Williams' new book, Atlantic Surfers, which I mentioned yesterday. It's of Steve Daniel, a man I would have liked to have met when I was researching Surf Nation. A nice, quintessentially British shot, you'll agree, and one that makes you want to check out the rest of the book. But where, knowledgeable surf friends, was it taken? I sit here writing this with a right quad muscle in a right old mess because, yes, I did play football last night. Or rather, I impersonated, highly unsuccessfully, a footballer. Playing with a quad tear and trying to use just one's left foot, when one is right-footed, is not, I have discovered, a recipe for brilliance. The net result of this act of stupidity is that my leg is so knackered that I'll need to be winched onto a surfboard for the next couple of weeks, and certainly won't be playing footy for a while. However, my pain is ameliorated by Graham Shepherd's illuminating comment to a post of a couple of days ago. Thanks to Graham, I learn that Jimmy Pursey, of Sham 69, was a surfer. Perhaps not a surfer in the full-on sense of the word, but someone who can say, legitimately, that he has stood on a board and ridden a wave. It also transpires that Sham 69 were, in some way, at the heart of mid-70s UK surf culture, being regular visitors to Skewjack Surf Village. Meanwhile, here is some surf news. First, I hear that Wavelength is under new ownership. Anybody know more about this? Secondly, top UK surf snapper Alex Williams - a man who has possibly been around almost as long as Sham 69 - has published a book of vintage surf photography. It's called Atlantic Surfers and its shots are from the 1970s (Sham 69's heyday, as it happens). It looks well worth the investment. Talking of investments, that Sham 69 CD I bought the other day does have a couple of classic tracks, including the evergreen Hurry Up Harry (sans 'H'). A bargain at £5.99 and available from all services at Taunton Deane on the M5. The demented surrealist inspired by Surf Twisted has left the parish of St Levan. He was banished late last night by the Friends of Porthcurno, whose leader, Ms Carol Thatcher, had this to say of his antics: "That demented surrealist is a menace. He wants to build a skyscraper on the beach and is in league with the forces of the Death Star. Fortunately, we know how to deal with his kind. We have set up an exclusive club, to which he is not invited." In his place, Alex 'Quad Tear Take Off' Wade is now writing this blog. He wishes to report that Spot G this lunchtime was bereft of any other surfer save for Sam Bleakley, who was leaving as he arrived, and Tup Newman, who was in the line-up. One other gent was out in surf that was far chunkier than it looked from the cliff. He didn't look too happy and, indeed, Tup feared at one stage that he was drowning. Thankfully this wasn't the case. Mr Wade says he paddled out and spent an hour or so at one of Cornwall's best breaks with absolutely no one else out save for his friend Mr Newman. A couple of sets were solidly overhead and a fine time was had by all two of them. As Mr Wade said: "That was very good. I love February." Afterwards, Ms Thatcher refused to apologise, and had this to say: "It is my belief that Alex Wade suffered a further rupture of his quad tear on one or two take-offs today. It is my further belief that he suffered pain and that he would be a fool to play football later. However, he will probably try and play, because he is a fool. That's why he's not in our club. Goodbye." Image courtesy of Ocean Image. Is a blog as GOOD as a cactus? If you, like me, want to know the answers to these questions, there are two places in Cornwall where you might find them: Twisted Towers, and in the third aisle at Tesco in Penzance. But back at Ikea, in Bristol, where Karen and I recently praised the Lord, there's just one question on the customers' minds: can Tony Plant be stopped? Except for another, which was uttered nearby in a service station, where I bought a truly dreadful Sham 69 CD: should Tony Plant continue? In my newfound status of television presenter (Scandinavia), I am launching an investigation into the recent trend among habitual surf bloggers to go completely bonkers (Shurely shome mishtake? Ed.) and write gibberish. Of what relevance, for example, is whether shoes can think - and I think they can - to surfing? None at all. And there, my friends, is the rub. Not to mention, a Twisted New Shark. Last Friday I had an enjoyable surf at small and clean Perranuthnoe before hitting the road for the Cotswolds. The reason for this visit was because SVT, the Swedish equivalent of the BBC, had read something I'd written five and a half years ago for The Guardian about Jonathan Phillips, a former concert pianist who had decided to return to fray with a performance of Rachmaninov's Piano Concerto No. 3. This was no small undertaking, for the Rach 3, as it's known to the cognoscenti, is one of the hardest piano pieces ever written. SVT found this piece and dropped me a line, asking if I'd like to interview Jonathan for a programme they're broadcasting in a couple of months. More details nearer the time, but suffice to say that I spent an interesting day on Saturday with Johannes and Magnus from Sweden doing something I'd never done before - being a TV presenter. A strange departure, but perhaps yet more surreal was the moment when we ended up filming in the quintessential, idyllic Cotswold garden of a lady I know only as Patti. Patti is an impressive, likeable sort and I knew her from our time in the area, because she was a governor at the boys' old primary school. She asked how life in Cornwall was treating us, and I said it was great, not least because of the surfing. I didn't expect Patti to know the first thing about surfing but, quite extraordinarily, it turns out that she has a cousin in Hawaii "who's a champion surfer". His name will also be revealed in due course. It was good to see a bunch of old friends, but it's better yet to be back home and know that waves are on my doorstep again. I'm not quite sure how I existed up there, away from the sea, for six years. Meanwhile, Harry tells me he's coming out of retirement to score some waves this week. And if you click here, you can check out yesterday's Coaster column in The Times. Who Is The Oldest Surfer In Britain? Last weekend my Times 'Coaster' column focused on Alan 'Fuz' Bleakley, whose 60th birthday coincided with his having achieved 45 years of surfing. That's a lot of waves, though not quite as many as Dale Webster, the North California surfer who's logged almost 12,000 consecutive days' surfing. Following the appearance of the piece on Fuz, Sally Parkin of Original Surfboards dropped me a line. Who is the oldest surfer in the UK? asks Sally. In this neck of the woods, I can think of Pete the Yank, still going strong in his mid-70s, while I think there's a surfer in St Agnes who's 80. However, if we're going to branch out to include surfers who ride belly boards, Dot Long, 81, is surely a contender. Thanks to Sally for mentioning her, and below is some great, inspirational footage of Dot doing what she loves best. This time last year, I was plagued by a chest infection that wouldn't go away. It was cold and I went for a few surfs, which only made it worse. Then, playing football in below par condition, I pulled a hamstring. I thought it was better, played a couple of weeks later, and tore another muscle (my right quad). I arrived in Barbados for a long-awaited surf trip in April, having not surfed for weeks for fear of aggravating my many and various ailments. This year got off to a cracking start. I surfed pretty much every day for the first half of January and felt fit and healthy. Then came the flu*. Three weeks later, I've still the remnants of The Most Evil Bug I've Had For Years. I've been for just the one surf so far in February, and though it was good am not sure it helped my quest for full recovery. But last night, during football in Penzance with Deadly Greg Martin, Bodyboarder Paul and Big Wave Chris, to name but a few, I felt a twinge at the top of my right thigh as I rifled the first goal of the game into the net. The twinge intensified a minute later, when I scored again. I took it easy and opted to play in Molby-esque fashion (i.e., I would only run if I really, really had to), but 20 minutes later another right fight shot resulted in the quad muscle tearing. Yes, the same one as this time last year. I played on, using my left foot except for when I forgot that the right leg was useless. Such memory loss resulted in a lot of pain. So here I am, knackered having not slept well because the leg was so uncomfortable. I'm six weeks from a longed-for surf trip (to Costa Rica) and I feel like an 80-year-old. Now I'm not being ageist - many of my best friends, not to mention family, are in the 80+ zone - but this is far from ideal. Tonight, distraction looms in the form of a party hosted by Relentless at York Hall, in Bethnal Green. I've boxed a couple of times at York Hall, a venerable old venue, and boxing is on show tonight, too. There will also be some hip and trendy music, and an array of young, glamorous people. It's just the place for an old git with a torn quad muscle (Grade 2), so rock on! That's what I say - I believe it's an expression that still has currency among the young people, isn't it? * I really did have flu, as opposed to a mere cold, and am prepared to swear an affidavit to this effect if necessary. ** It's great being on the cusp of losing one's sporting ability once and for all. I love it. Yes! *** Pictured: my legs, as previously shown. They're nowhere near as alluring now that one of them can't be touched.